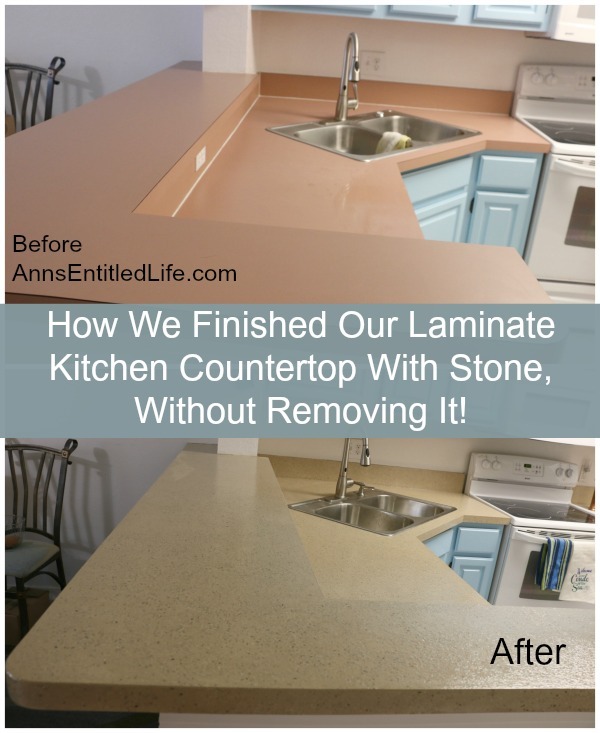 How We Finished Our Laminate Kitchen Countertop With Stone, Without Removing It! 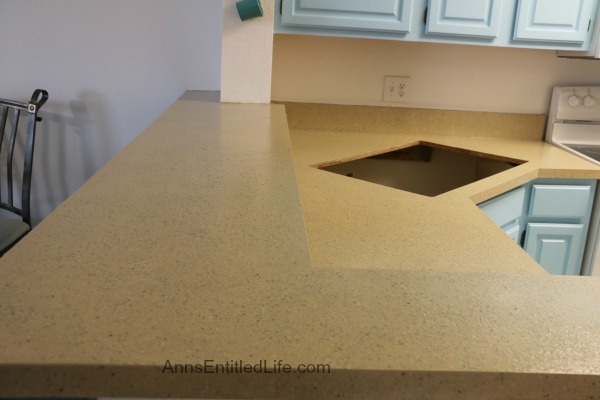 The kitchen countertop in our condo in Florida was in sad shape. 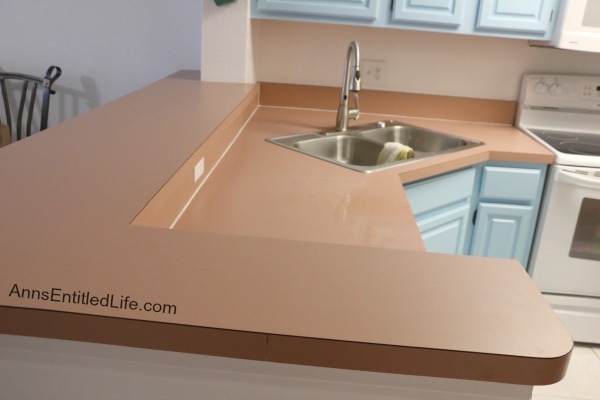 It was stained, pink (that was the original color choice 20 years ago) and just plain ugly! 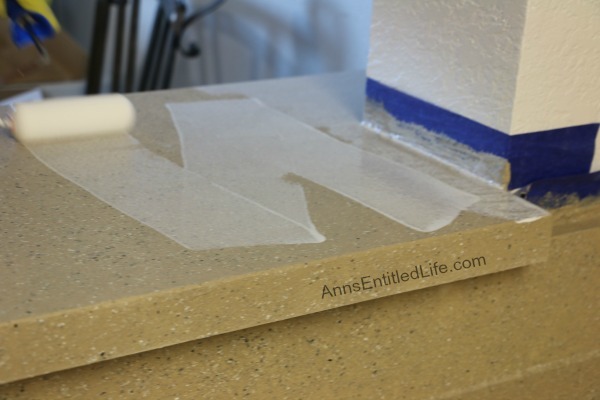 Hubby and I had looked to re-laminating, or replacing the countertop this year. The condo across from us had a nice cosmetic lift prior to sale last year. The man who did the work did an excellent job re-laminating the neighbor’s kitchen countertop, so we asked for his name and telephone number, and said we’d call him “next year”. Well, when we arrived in January one of the first things I did was look for that man’s name and phone number. You can probably guess what happened. After looking and looking, and looking (and this place ain’t that big), I came up with nada. 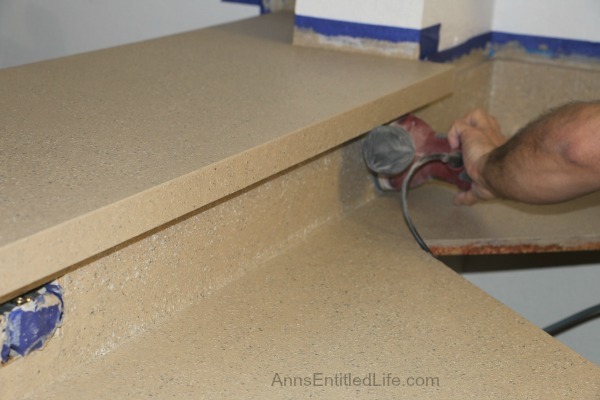 So now it was on to plan B which was either find a fabricator and have them make a new laminate countertop, or replace with quartz or granite. 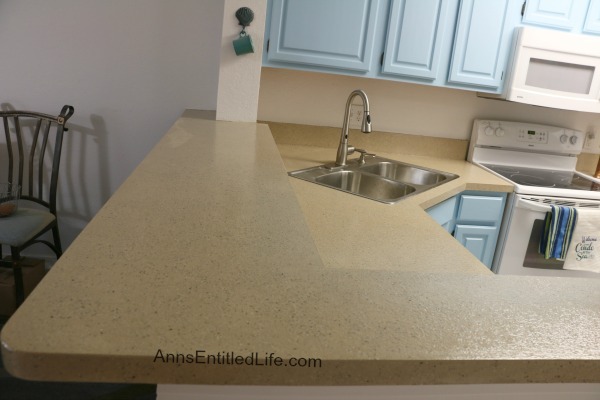 When we purchased this condo we knew we needed a new countertop, sink and faucet. The faucet we installed last year had 3 months of actual use and was going to be transferred to any new sink we purchased. The quartz option was immediately discarded; at $65/sq ft to start, it did not make sense in this condo. The view is the main draw to this place, it is not upscale in any way. 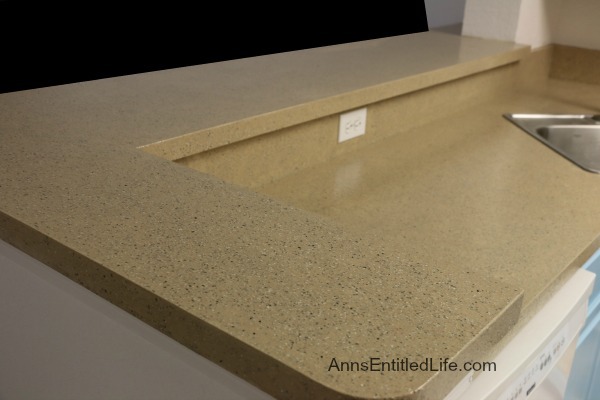 Starter granite looked fine for our purposes, but the cost worked out to approximately $2800 for our small countertop. 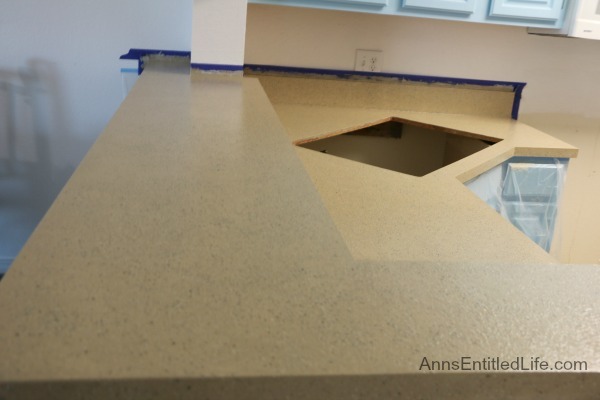 While that did include an undermount sink, it did not include the plumbing to reconnect the dishwasher, garbage disposal and install the facet. 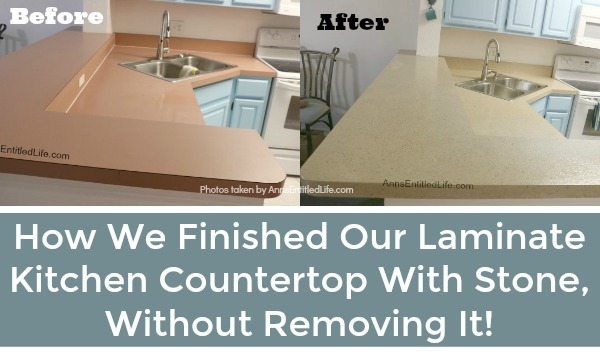 After looking at a ton of granite places (they all start to blur), Hubby finally decided “we” could redo the countertop ourselves with a refinishing product. He then went on a mission to look for something that would look semi-decent, be usable after a few days, and be durable. He decided on Daich Coatings. 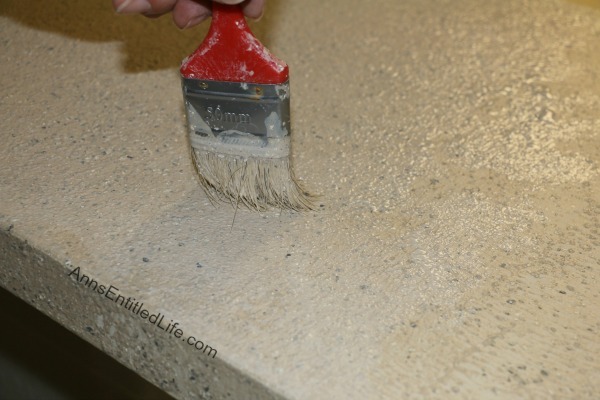 They make a lot of different products for residential and commercial buildings for both countertops and floors. 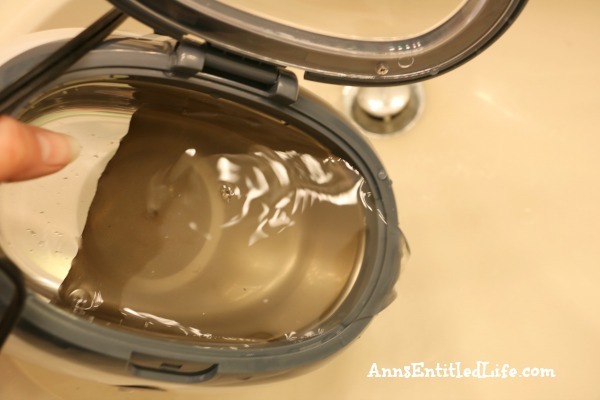 We decided on Sundance in the mineral collection. Warning: our finished color looked nothing like the color on the website. Hubby also chose to get the two part epoxy instead of using the one part clear coat that came with the kit. Our kitchen countertop is approximately 45 square feet. 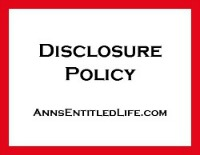 The coverage listed on the website is: Coverage Area: Kit covers 30 – 35 sq.ft. of countertop or table surface, so we ordered two kits. And now Hubby has a second kit to bring home and use on a rental. 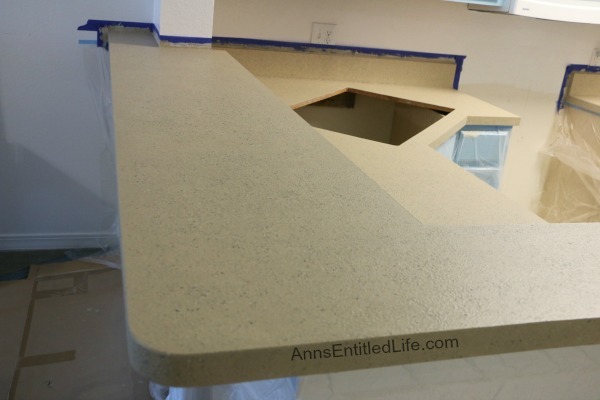 One kit more than covered our countertop, applying two coats of well, everything. If you order from the website and are in a hurry, you may want to call first to see the ship time. This is a Canadian company, so it needs to clear customs. In some real irony, they ship out of Buffalo. Well, looks like that second kit is returning home. 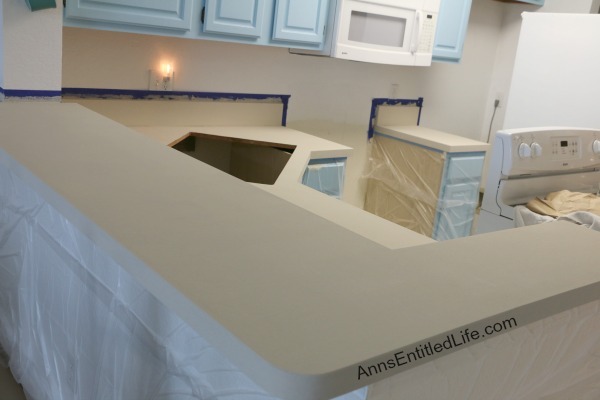 Before Hubby started, he taped off all the areas where countertop met wall. 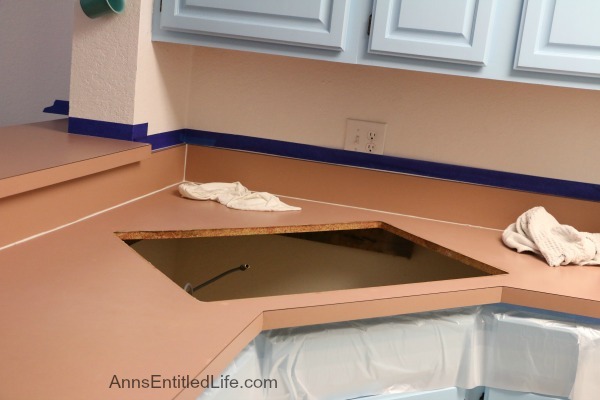 He removed the sink as we were replacing it when the countertop restoration was finished. 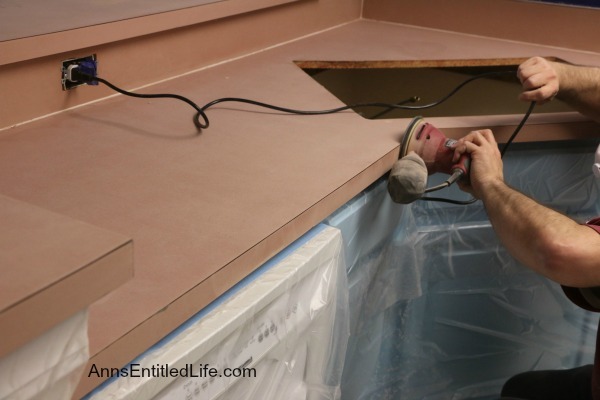 The suggestion from the Diach coating was to cover all the cabinets too. Hubby took that suggestion to heart, and used Tape’n Drape. 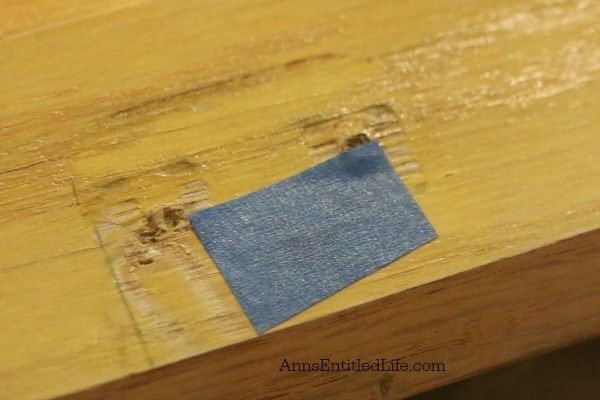 This turned out to be a very smart move as the product did splatter a bit, and there was paint and clear coat on the Tape’n Drape when Hubby removed it. 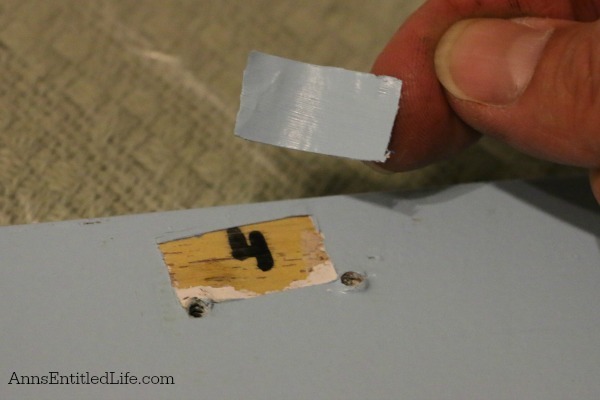 If you have any gashes or tears in your laminate, now is the time to “repair” them. We did not (it was just stained and ugly), so Hubby went on to the sanding. 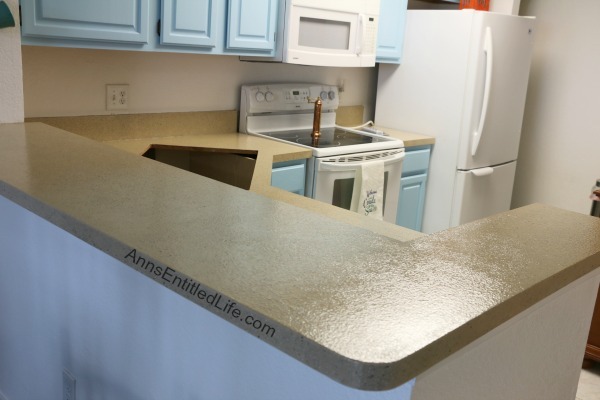 He used an orbital sander (80 grit) for the large, flat parts, and hand sanded the backsplash and edges using 80 grit sandpaper. Next up was the primer coat. He put on one coat in the evening, allowed it to dry completely, then put on a second coat the next morning. Next up was the color coat. 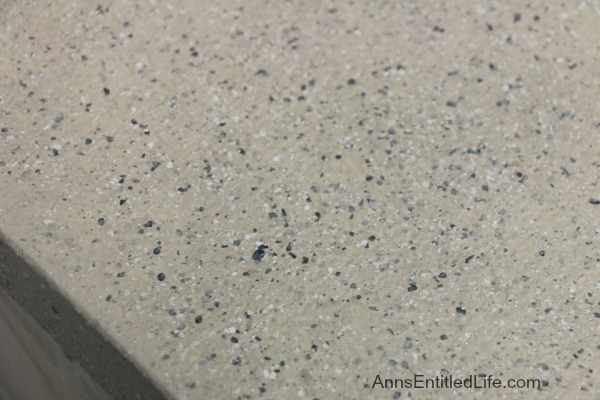 The color coat is premixed, but you stir the speckled granite up from the bottom. Hubby said stir well so that it really mixed up. He followed the directions on painting, and said the roller that is included in the package is garbage. What he ended up doing on the second coat was rolling out the color, and then stippling the paint with a decent brush. Stippling is basically bouncing your brush up and down to paint, instead of moving it side to side. 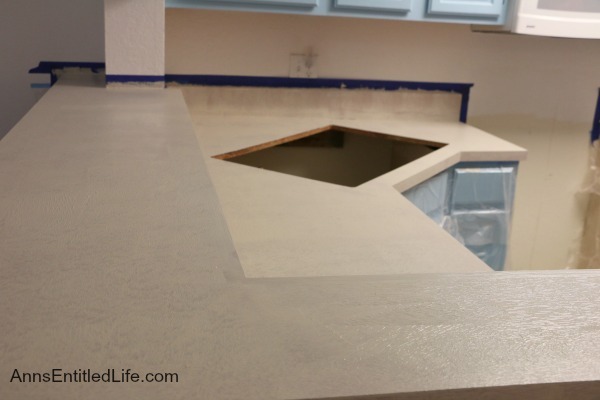 This is what the SpreadStone Mineral Select Countertop looked like after the second coat. Already it was a huge improvement, and Hubby had not even sealed it yet. After the paint coat, Hubby sanded twice; first with 120 grit, then with 220 grit. 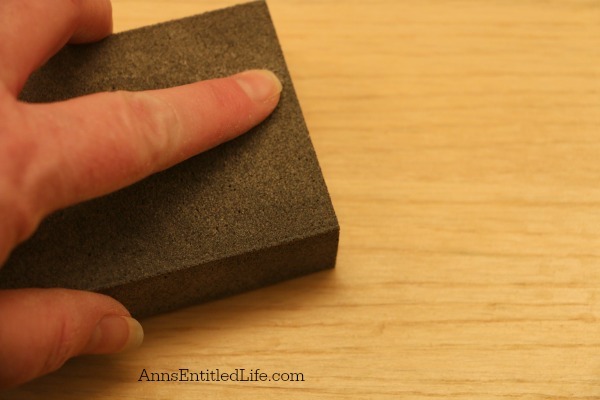 He vacuumed between sanding, and used a tack cloth in between sanding grits, as well as at the end of sanding. 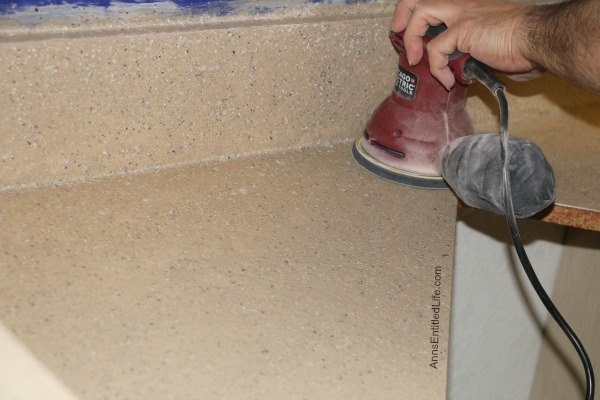 He said if he had to do it again (and he will be at a rental), he’d get an even finer grit for a third sanding pass. Hubby chose to go with the two part epoxy instead of the one part that came with the kit. 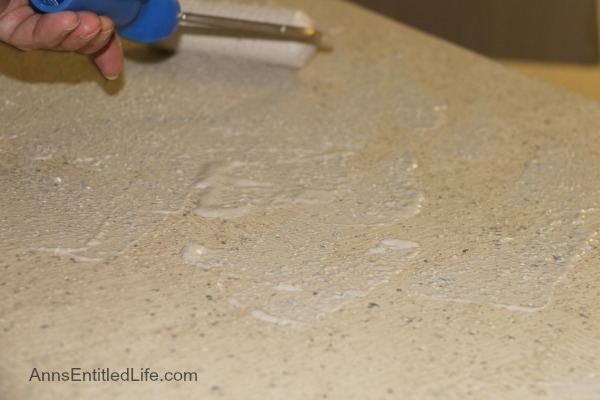 You had to stir a long time to combine (3 minutes), and the epoxy went a long, long way. 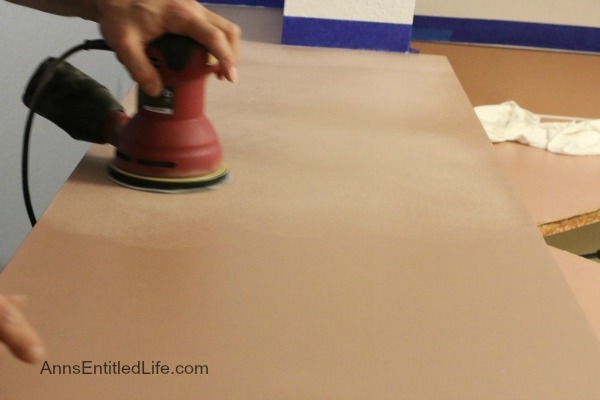 The first coat he applied, he mixed the recommended amount and had a ton leftover. This goes on quite thin. 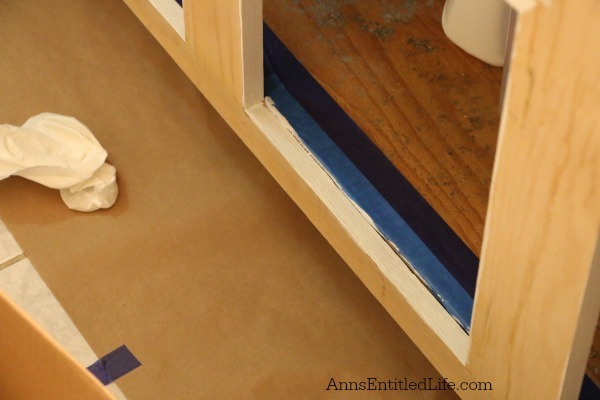 He halved that amount for the second coat, and had a bit leftover (but not a ton). This is what it looked like the morning after the second coat. 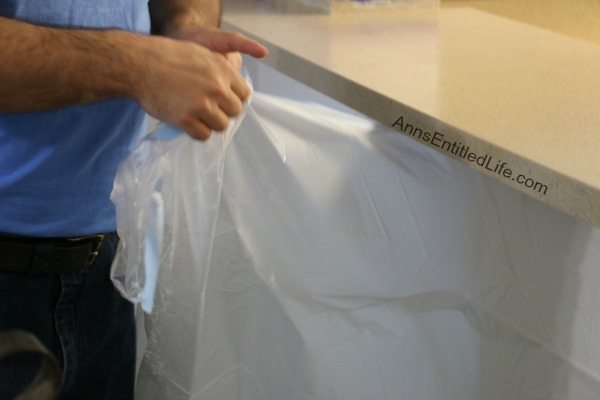 Removing the Tape’n Drape. was simple, removing the painter’s tape took some finesse. 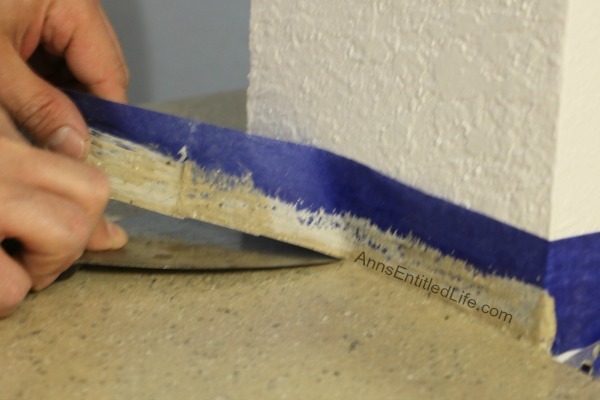 First he cut the edge where the tape abutted the wall, then he used a spackling knife for pressure so none of the coating came up with the tape. This is the finished product. And this is our kitchen put back together. In all, this project took four days from start to finish. 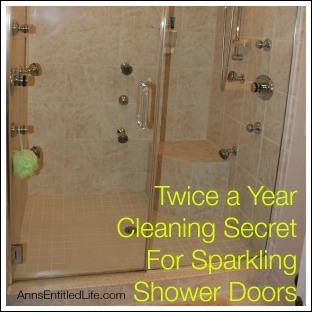 When Hubby suggested this idea, I was a bit wishy-washy about it. On the one hand the price was right. Two kits (we only needed one) and the two part epoxy and we were in for about $250, significantly less than the $2800 for granite. I figured for a bit less than 10% of the cost, we could give it a go. Worse comes to worst, we installed granite anyway and were out $250. In the end, this was the right decision for our condo. It looks fabulous! No, no one will ever mistake it for granite but the stone is attractive. The surface is rougher than Hubby would like (and why he’s do a third sanding pass with a finer grit), but I rather like the roughness. Clean-up is a breeze. My chief complaint is the color is nothing like I expected. For us, that did not matter much. 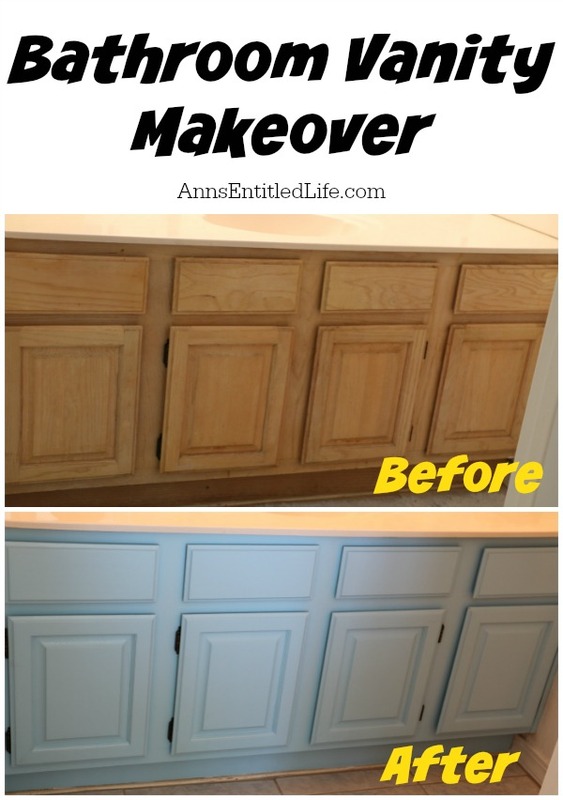 We painted the kitchen cabinets the same blue we used on the bathroom vanity make-over so the tan-ish color and blue specs work well. Someone else might not be as happy with the color deviation. 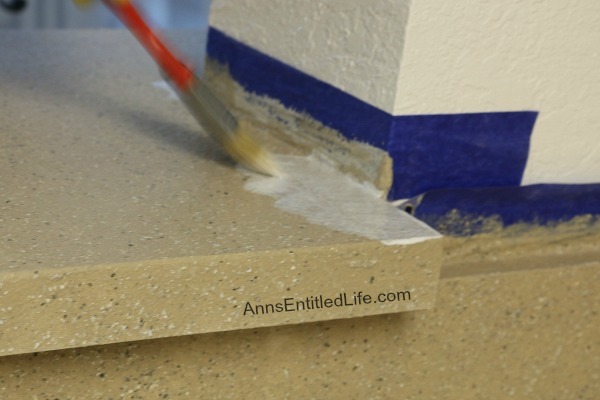 All-in-all I would recommend the SpreadStone Mineral Select Countertop in all but higher end homes. 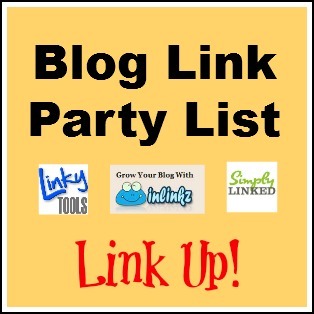 It looks good, and the process was pretty straightforward and very easy to do. 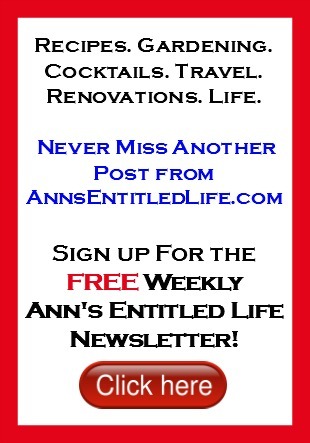 • For more Renovation posts on Ann’s Entitled Life, click here. 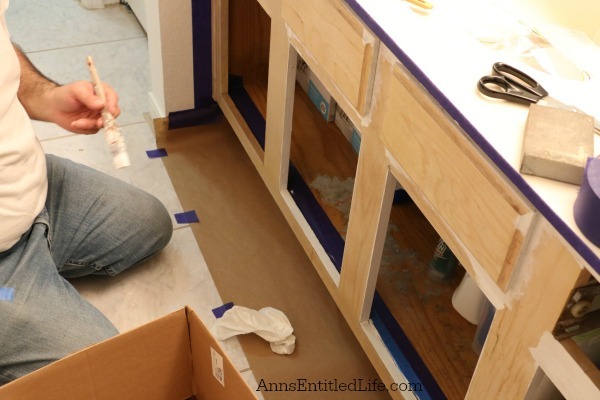 The step by step process of updating our bathroom vanity built-ins in our Florida condo. 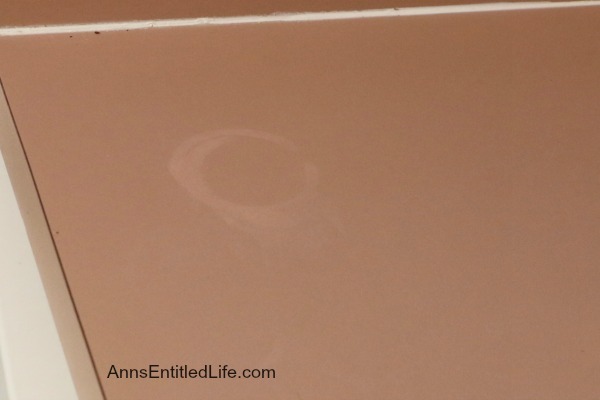 Hubby and I had talked a lot about ripping out the vanities, countertops, etc in our Florida condo. They were in rough shape, and original to the condo. 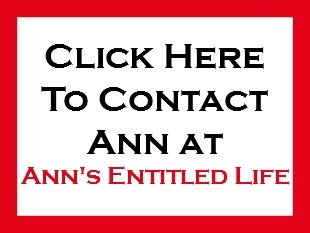 But, we started talking about how long we plan on owning the unit, if we’d ever get the money back on those upgrades, and whether or not we wanted to go through the brain damage of ripping out and replacing the units. In the end, we decided that, for now, it wasn’t something we wanted to go forward with as a large project. 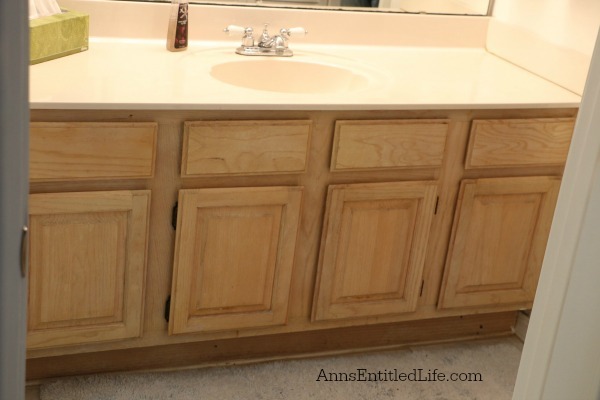 We did however, want to do something about the cabinets, faucets, and mirrors in the unit. We plan on upgrading the faucets, and framing the frameless mirrors. Hubby also wants to update the light fixers. I actually like them. They are the open bulb bathroom light units that look like this, but they give off gobs of light! Still, I am not opposed to an upgrade. The cabinets looked beat. While I am usually opposed to painting wood (I’ve stripped enough wood furniture and molding in my time), that seemed the only solution for these boxes. 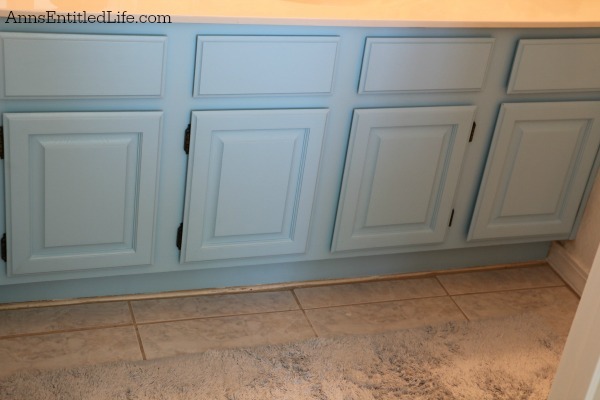 We looked to the Rust-Oleum Cabinet Transformations but after reading the reviews, and looking at the ingredients, and lack of color choices, we decided to go it on our own. 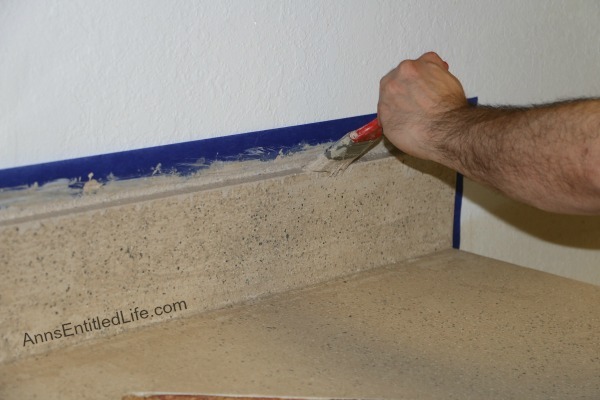 Hubby had used Insl-X Stix on some very tough jobs, and felt it was the product to use for our primer. So off we went to the local Benjamin Moore dealer to pick up a gallon. 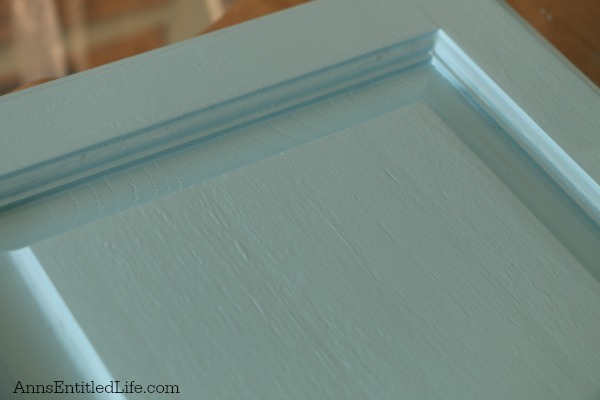 While there, we also picked up a gallon of Cabinet Coat paint that we had tinted Hawaiian Breeze. Eight years ago we had the kitchen cabinets at our house in New York State painted with Cabinet Coat, and they still look great today! We decided to go with a paint we had used and trusted. Hubby removed the doors from the cabinets, and the removable drawers too. 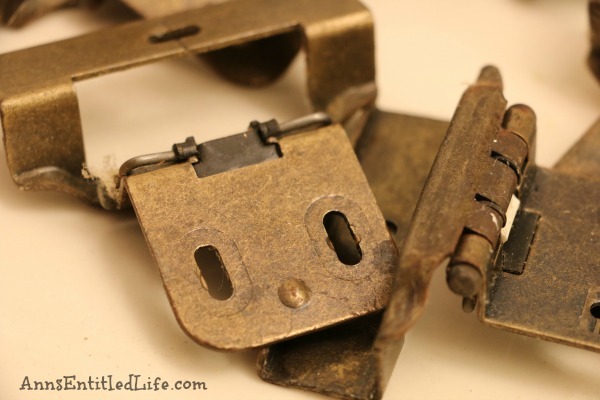 After he took the hinges off, I cleaned the hinges well using this method. I TSP-ed the cabinetry to clean it before sanding. I was a bit nervous about this as I was worried that some of the finish had come off leaving bare wood, but in the end it was not an issue. Once the hinges were removed, the doors were marked with a placement number. This was so we knew exactly where they came off the built-in, and could return them to the proper opening. Hubby then covered the number with a piece of paint tape. This was painted over during painting. The piece of table was removed after the painting was completed. 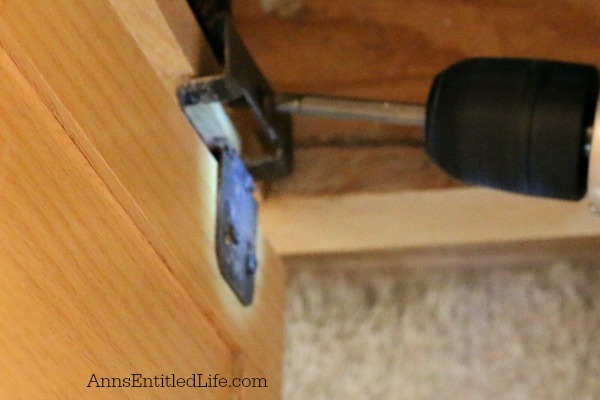 He then reattached the hinges, and rehung the door in the proper space. 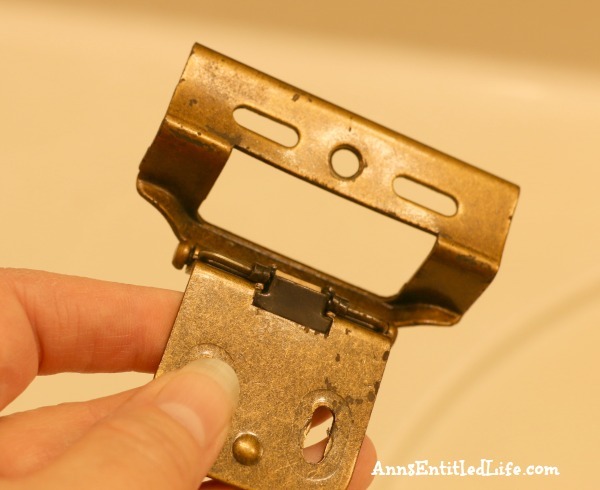 The hinge completely covers the small unpainted portion where the number was. 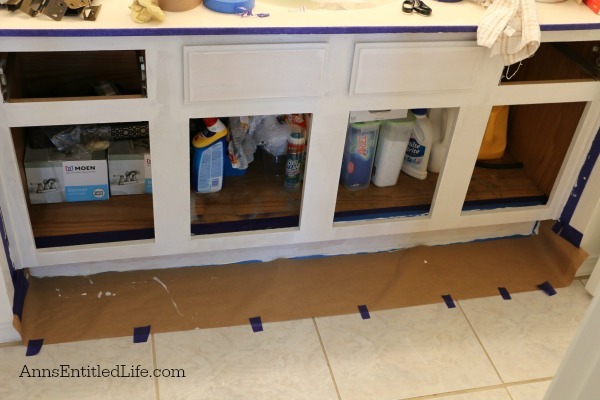 He taped off the edges of the built in cabinets, the floor, the upper part where the cabinets meet countertop, as well as the inside of the cabinet as we were not painted that. Since we are in a condo, space is tight. Hubby set up in the guest bedroom. We covered all the furniture with drop cloths, as well as the floor. Hubby also cut up some large cardboard boxes to put on top of the plastic drop cloth on the floor so it would not move with our feet. 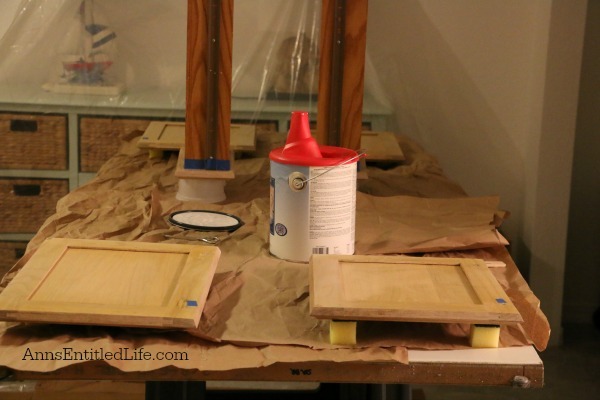 We then used an old door as the paint shelf, laying it across two saw horses. 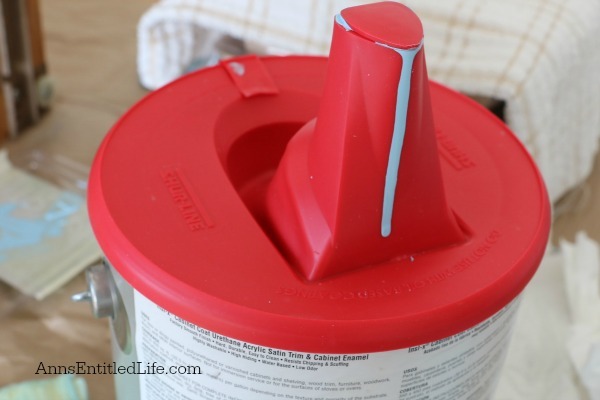 Hubby just loves that $3 Shur-Line Paint Can Lid and Spout he recommends in his 10 Easy Paint Tips. 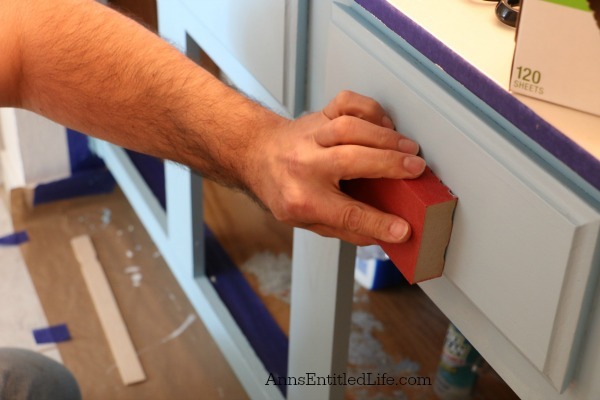 The cabinetry was given a light sanding before any painting started to smooth out any edges (surprisingly few! ), and prep the wood for primer. It was also lightly sanded between the primer and color coat (ok so I was a tad late with this photo). 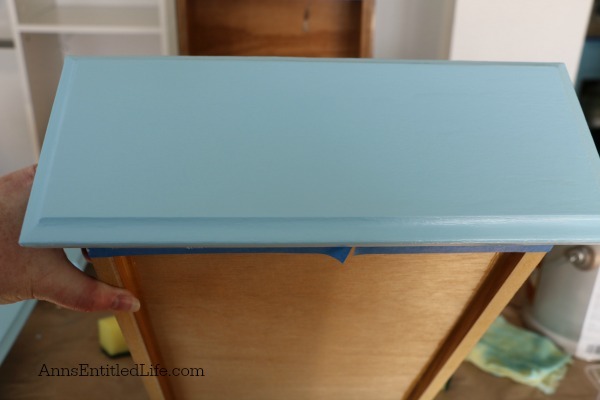 Hubby gave the cabinet a coat of primer, and both sides of the doors and drawers. He waited a complete day to put on the first color coat over the primer. It wasn’t due to necessity on the part of the primer, but rather because we had stuff to do. Hubby used two coats of paint color. He waited until each side was dry before turning. I was the eyes looking for drips and splotches. 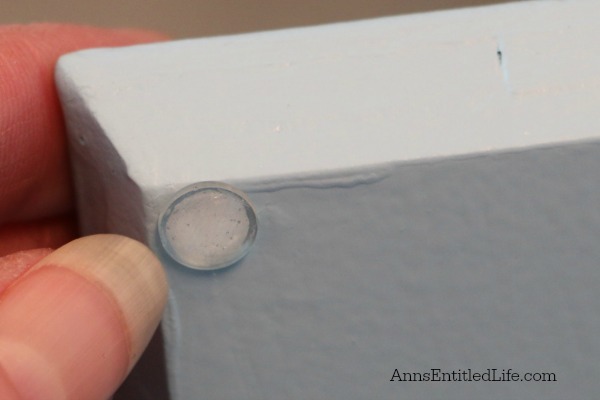 The Cabinet Coat is self-leveling, so the few bubbles evened out, but nothing will even-out a huge drip! 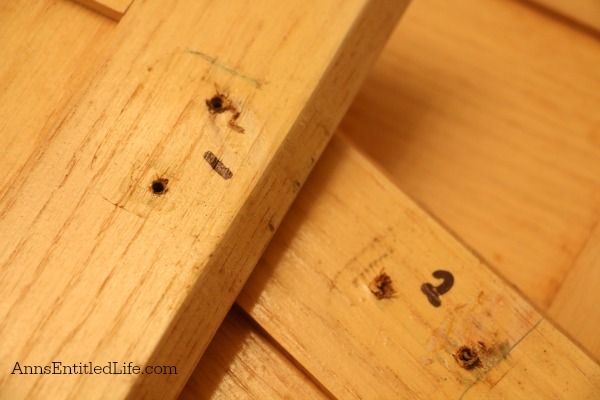 Once he was finished, he reattached the hinges and added plastic bumpers. This is the finished product! Unfortunately, the photo does not do the job justice. It is a dark room with no natural light. It does look wonderful in person! The second bathroom received the same color, and it too looks beautiful. 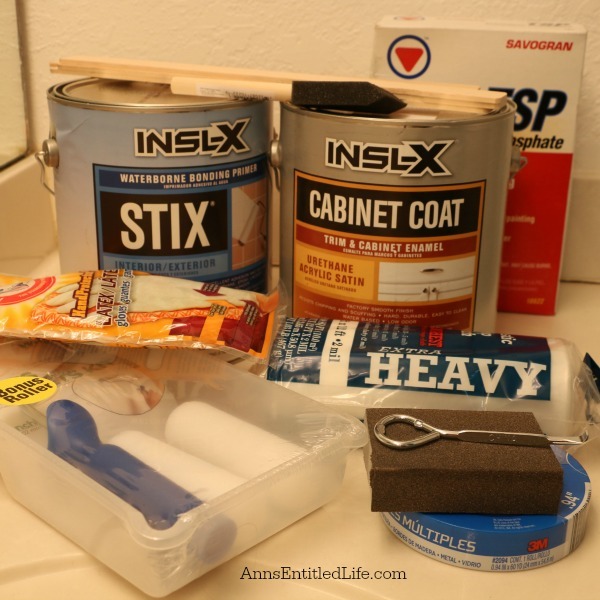 While we purchased a gallon of paint (having two bathrooms and another project in the same color), you really only need a quart of each to do a bathroom vanity. A little goes a long way with both the Insl-X Stix and the Cabinet Coat. 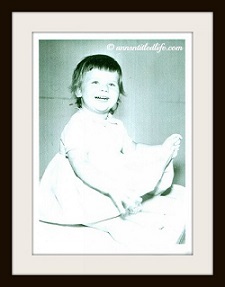 The entire project took Hubby five days as …. we had other stuff to do. 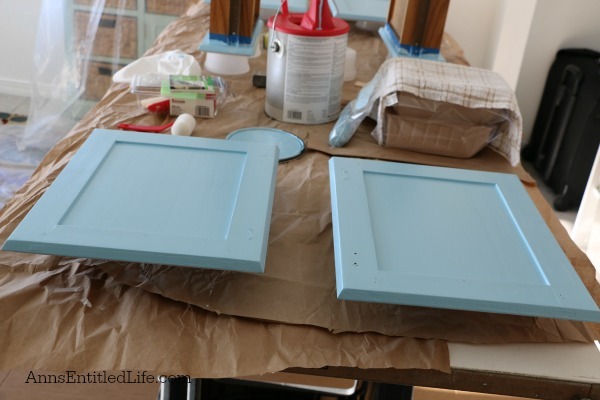 If you wanted to do the same project and just allowed for time in between coats to dry, this could definitely be done in a weekend. 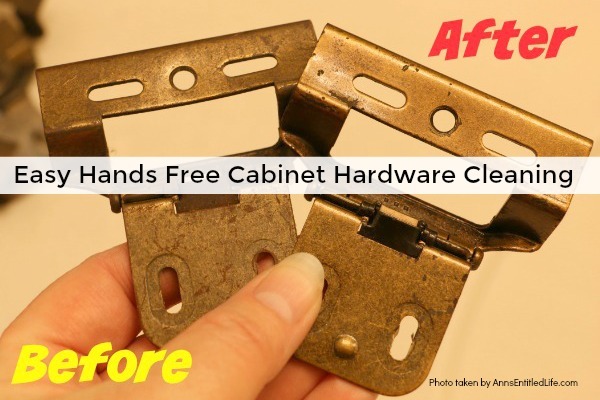 How to clean your cabinet and door hardware in under 3 minutes without getting your hands dirty! As I mentioned Monday, we are back to the renovation grindstone. 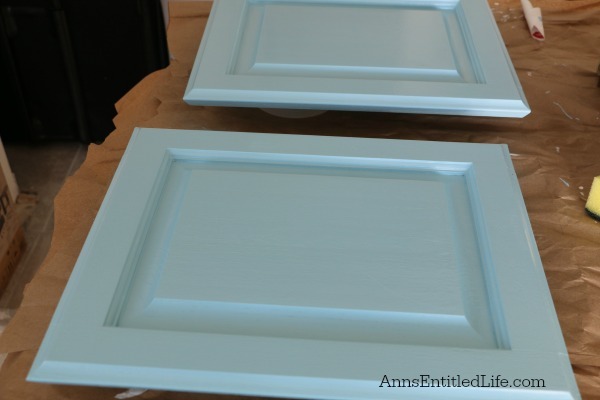 One of our projects is painting the kitchen and bathroom cabinetry at our condo. 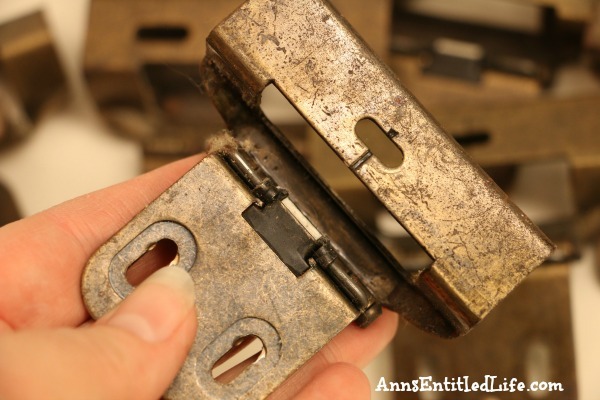 Hubby asked if I wanted new hardware, but the stuff they have here is fine as they were only cabinet hinges (no knobs or pulls, so YAY!). This condo was purchased from the estate of a little old lady that passed away, and wasn’t as clean as it could have been. Hubby suggested cooking them in the crockpot. 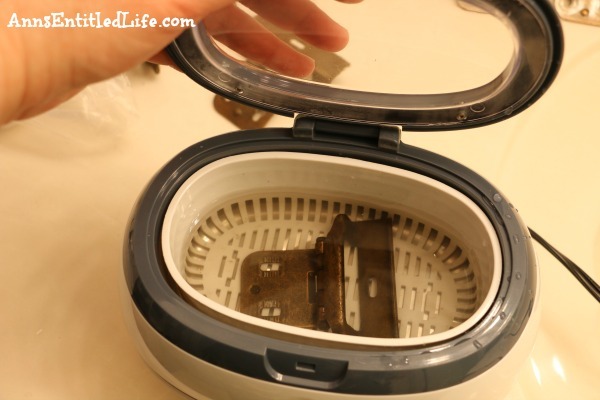 He even bought a liner so we could cook the cabinet hardware overnight. 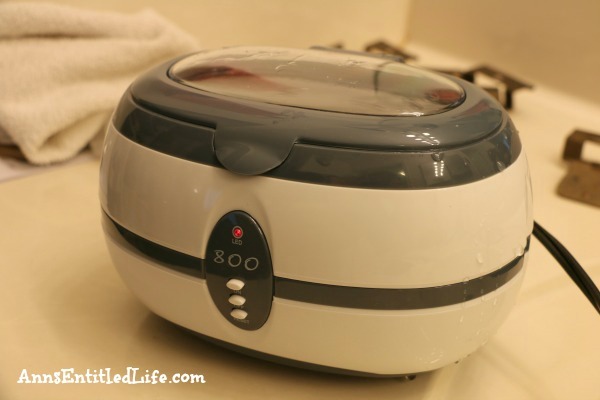 But, since there was no paint to remove and they were only dirty, Hubby has second thoughts and suggested I try my Ultrasonic Jewelry Cleaner Machine instead. 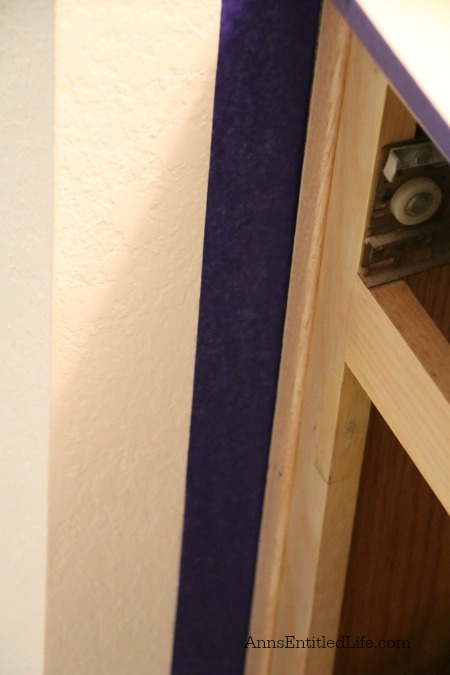 It was a bit slow going as the hinges were large and my machine could really only comfortably fit one at a time (the screws were simple, they all got plopped in at once). 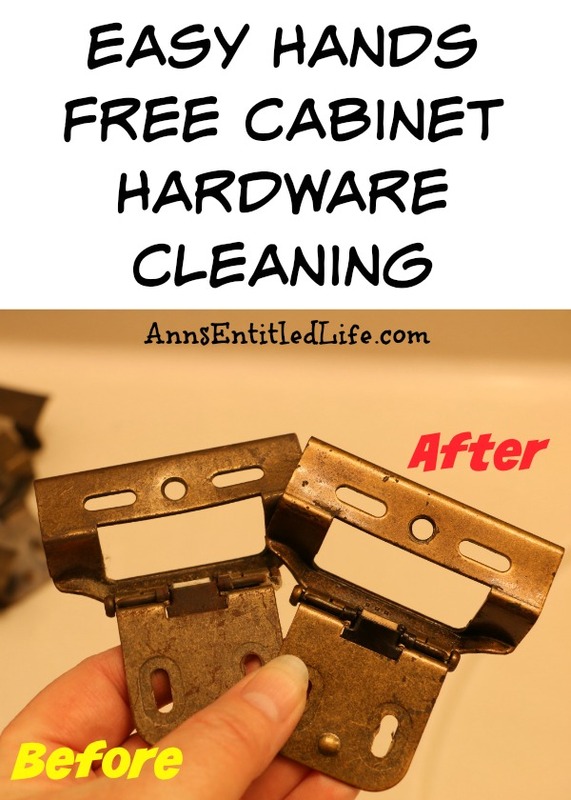 We started off by removing all the hardware from the cabinet doors. It was pretty grubby. It actually felt even worse than it looked if you can believe it! I filled below the max line with clean tap water. I put in one of my grimy hinges, snapped the lid shut and plugged in my machine, and turned it on for 3 minute cycle. After a cycle (sometimes two), out popped a pretty darned clean hinge. The water varied between very cloudy and dirty, and not so horrible. Regardless, I unplugged the machine (according to the instructions) and dumped the dirty water refilling with clean water for each hinge I cleaned. Truly a lot cleaner, and they feel clean too! 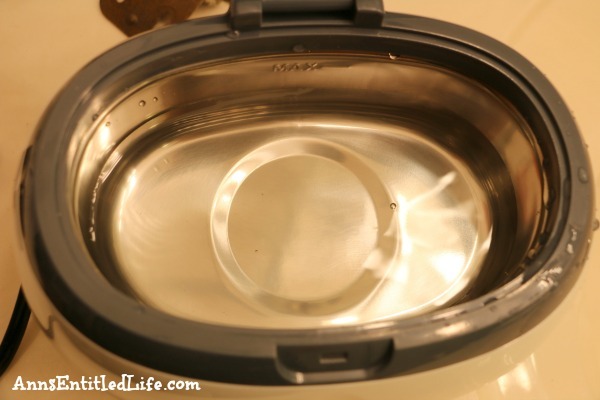 Now Hubby didn’t get this idea out of the blue; he said he has seen large large ultrasonic cleaners advertised specifically for tools at various home stores. He figured if it works in a large size, why not try the small, at home one we already have? 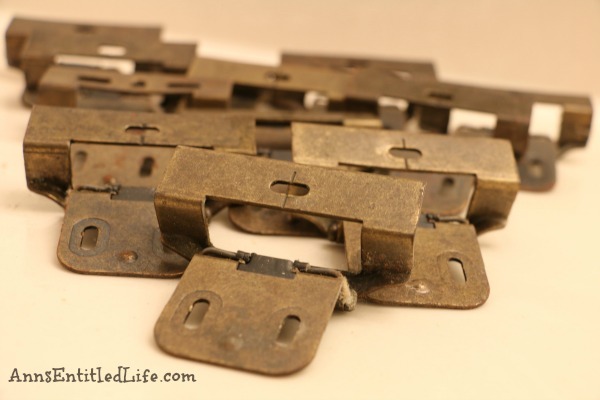 I did dry the hinges when they came out of the water, and oiled the hinges so they would not squeak and would move smoothly. 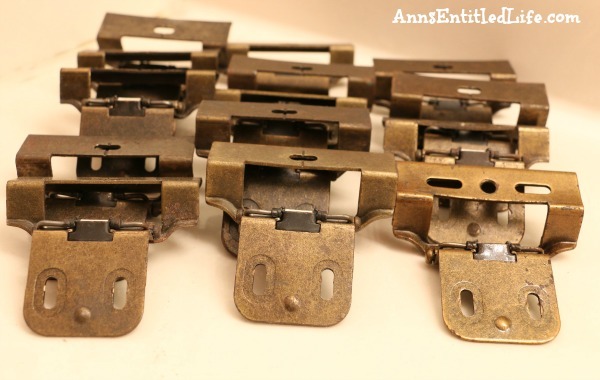 My hinges are 20 years old though, so the oiling step might be a YMMV.